The most solid product year in and year out has arrived! Yes, it's Upper Deck Series 1 Hockey, complete with the most desired rookie cards, the Young Guns. How does this year's release look? Anything new for 2011-12? You bet! Upper Deck has always been known for their beautiful base card photography. And this year is no different. The design of the base cards really give the most amount of space possible for the photograph. The cards let the pictures do all the talking. And they are truly is a wonder to behold. The images captured on these cards are really stunning. 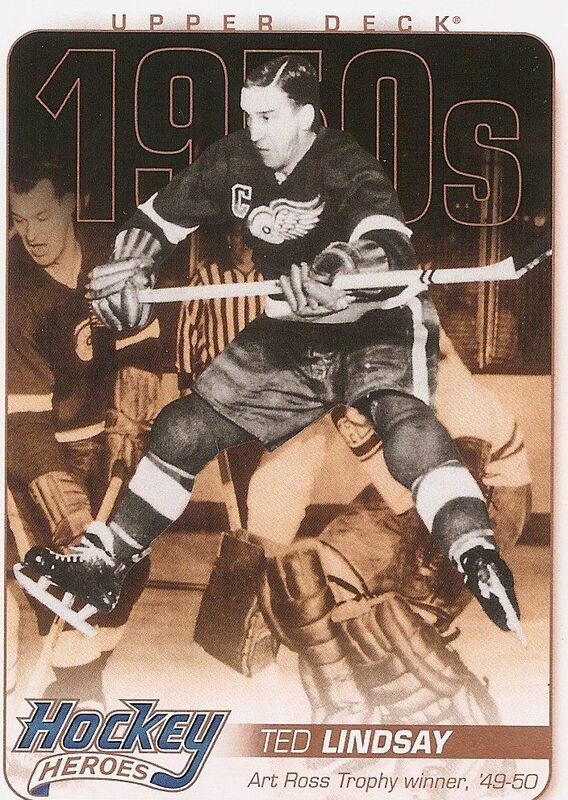 There are a mix of close-ups, action shots, special moments, and candid shots balanced together to make a comprehensive hockey card set. Just check out these cards! 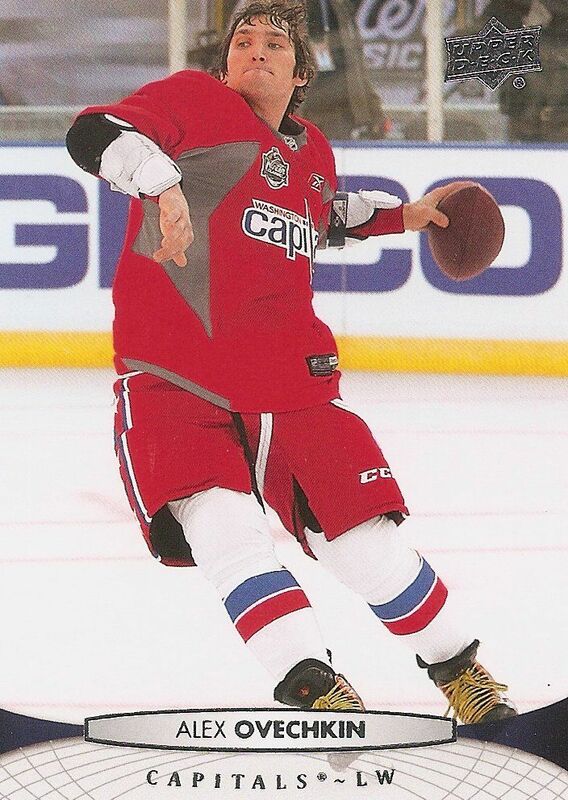 Maybe Ovi should start over John Beck... just sayin'. Hmm, a helmet would probably help lesson concussions. Steve looks like he's pretty excited. This is one of the Shark's most feared foes?!? Yep, Mikka, that's called 'the sun'. If I were to make one criticism of these cards, it would be the rounded looking 'globe' border of the vertically oriented cards. This design idea reminds me of last season's Ultimate Collection base cards - which were great, but it just seems a bit out of place here. And yes, only the vertical cards don't look as good to me. The horizontal cards look great with this design. The back of the card is very cleanly laid out as you can see. The top of the card features an alternate photo of the featured player. There is plenty of room for statistics and even a small paragraph of information for players who's stats don't take up the entire back of the card. As usual, the hottest cards to come out of UD Series 1 are not the jersey cards, parallels, autographs, or other inserts... the hottest cards by far are the Young Gun rookie cards. It's amazing that these non-numbered, non-autographed cards are so popular and sought after, but they are, and it's a fact: they defy the laws of collectibility. Each year I look forward to seeing what UD comes up with in terms of Young Gun design. I've really enjoyed the look of the past few year's Young Guns - the classy curves of 08/09, the quasi-futuristic lettering of 09/10, and the western-looking 10/11 cards. This year's look... is well... it's just... it's... sort of bland. In fact, these YGs have designs that look very similar to the standard base cards. It might be that UD is trying a more uniform set this year, and that's fine, but this year's design just doesn't get me excited about them. They don't even stand out when searching through a new pack. You sort of have to keep your eyes alert because of their similarity to the base cards. I am sure that these YGs will be equally as desired and collected as ever, but this year's design leaves me wanting. This year Upper Deck has inserted a few fresh new ideas into Series 1. The first one I'd like to mention are the Hockey Heroes insert cards. 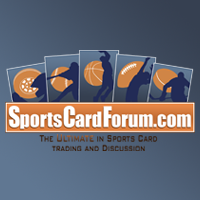 For years UD has chosen a great player and dedicated a set of cards to them. It was nice, but it wasn't fun pulling them out if you weren't a fan of the player. You just end up with a bunch of the same player and you don't really know what to do with the cards. This year UD has decided to dedicate the set to multiple heroes of the 1950's. It's a wonderful idea and let's you get a variety of players rather than just one over and over. The cards look fresh even though they feature very old photographs. If you're really lucky, you may even pull an autographed variation of one of these cards numbered to 15. There is even a triple autographed Hockey Heroes card to be found! It'll be great to see if they do a 1960's set next year or maybe even in Series 2. Another new idea for Series 1 are the UD Canvas cards. These cards are a special set printed on textured paper - similar to that of a painting. Each card is numbered with a 'C' standing for canvas, I presume. The UD Canvas cards feature even better photography than the base cards, if you can believe that. I feel that each of these cards is a piece of work, and would look amazing together in a binder. There are both standard Canvas cards and Young Gun Canvas cards to collect. In terms of mainstay UD Series 1 inserts, there are many. As in previous years, each hobby box of UD1 will come with 2 jersey cards on average. This year's design is a far departure from the past two year's. Instead of being very straight forward in terms of design, this year's jersey cards are full of vibrant lines and colors. So far collectors have expressed positive views of these cards. I like these cards because it's always fun to be able to pull a memorabilia card out of the boxes I buy. They can make good trade bait! Acetate cards can again be found in this year's UD1. 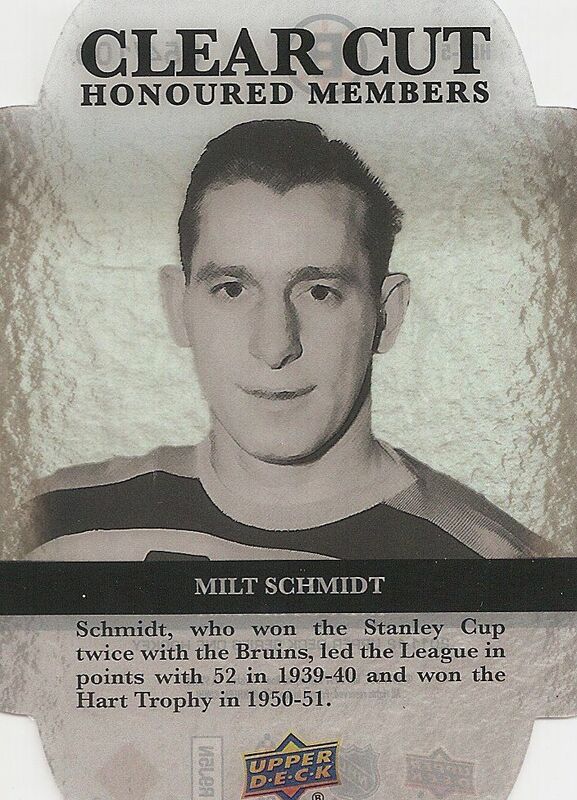 I was able to pull out a Clear Cut Honoured Members card of Milt Shmidt. This year's card has a unique design. The four corners are die cut in an odd shape. I'm not sure what it's supposed to represent. Do you have any ideas? These cards are numbered to 100. I wish that UD had put more color on these cards. I understand that they are representing older legendary players, but the lack of color on these cards make them look flat and unappealing. One insert set that I feel has been on the decline are the All-World Team cards. 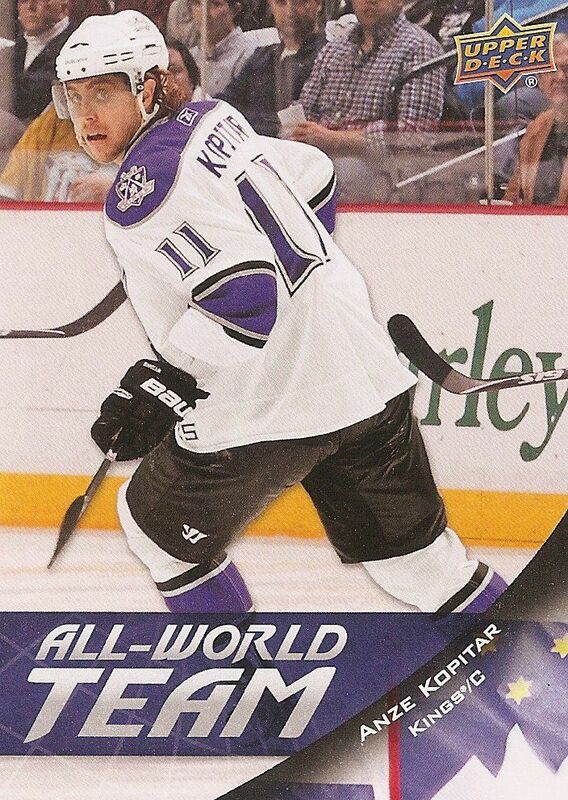 I love the idea of the All-World Team, but last year's and this year's design fail to measure up to the 09/10 look. This year's AWT cards are pretty generic looking. The graphics on the card look dated. Not to knock on Score... but this year's All-World Team cards look like it came out of that product. It's probably time to re-boot this idea or can it for next year. UD Series 1 has other inserts such as Signature Sensations, UD Exclusive cards, EA Ultimate Team cards, and more that can be found. Most of these cards have been a mainstay in UD1 for some time so collectors are used to these cards. They are solid inserts that will attract certainly attract player and team collectors. 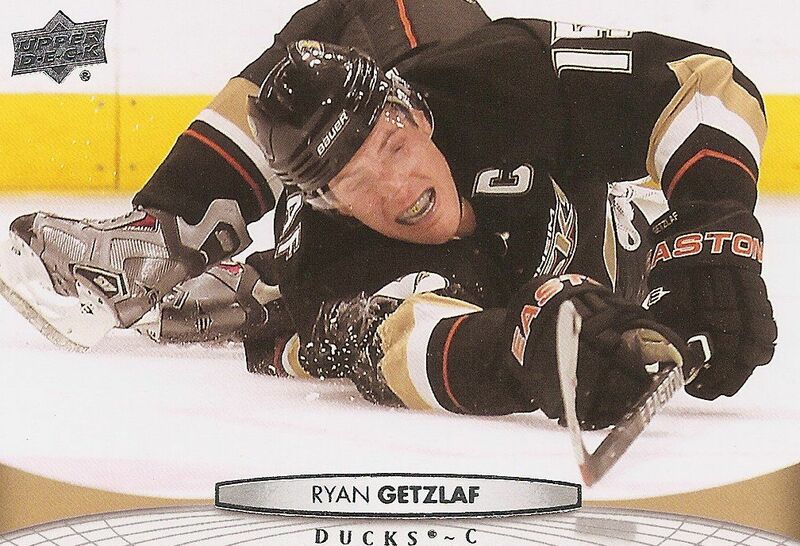 If you're a hockey card collector you pretty much have to buy Upper Deck Series 1. UD1 is a fantastic product that you just cannot go wrong buying. Even though I had a few issues with design here and there, I would still not hesitate to buy a box of UD1 whenever I could. Getting 6 Young Gun cards per box on average is great. They make fantastic trade bait and are almost always in demand. It's fun to get jersey cards, and you always have the chance to pull a sweet autograph card as well. Boxes will run about $70 dollars with packs being about $4. Yep, the price is definitely right. Get yourself a box now... duh! Here's a box of UD Series 1 that I got at D&P Sports Cards in Sacramento, Ca. Definitely right about the photography, I love that Reimer! The set looks great this year my favourite card you pulled was the Hopkins I think the Young Guns and base look really nice. I like the idea of the canvas cards. If I had to look at them ALL? Turns out I can't find any others, so we'll go with Ovie and Getzlaf. I love series 1 this year! I love the bases, glossies and every kind of insert.I also love your chances of getting a great rookie and the design of ud game jerseys. However it seems like an ok product becuase for 60 bucks you defietly have to hit somethig good. I think it would get an 8/10. 11/12 Upper Deck Series 1 seems to be an amazing product. Although it is hard to choose my favourite card would have to be card #44. Looks like Logan knows karate. I also like the chances to pull something amazing. I really like the Series One this year. I like how the young guns look in general, and how they changed the ud game jerseys. My favourite card was number 101. 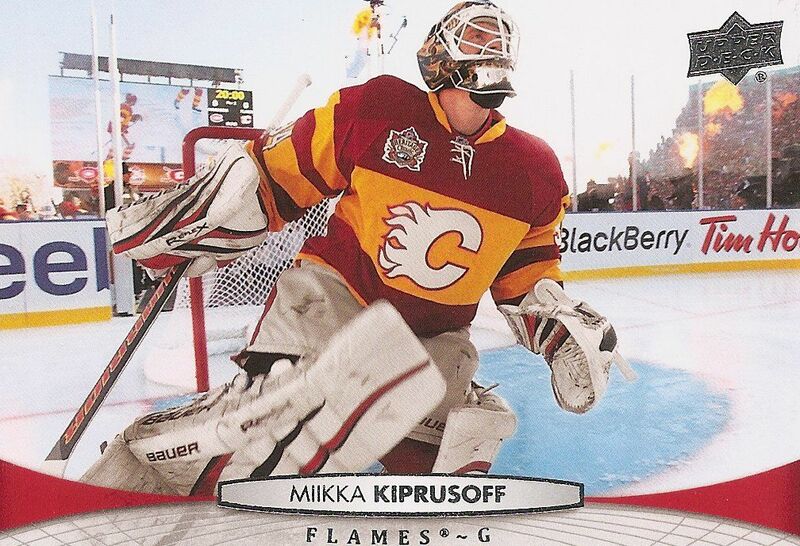 I like the kiprusoff base the best because it has a fresh backround and a nice focus. I think the young guns look like the base too much. My youtube username is flamescollector. 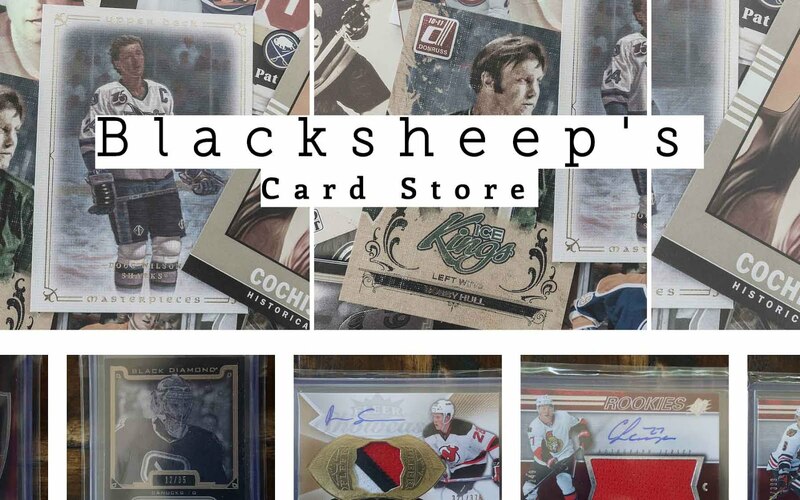 hey blacksheep here... you don't have to limit the cards to the ones i have shown... it can be any card from the entire base set! Series 1 this year looks amazing! 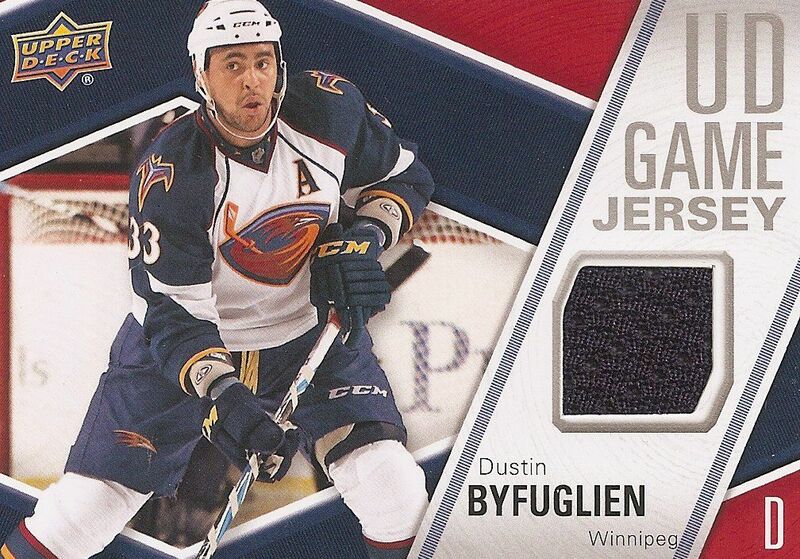 and my favorite base card would have to be Dustin Byfuglien. Also the canvas base card of Lundqvist looks amazing, that view from the net is just awesome, you get a great view of the whole arena. As usual UD has done very well with the photography. It is really interesting to see the different aspects of gameplay and stuff out of the game aswell! 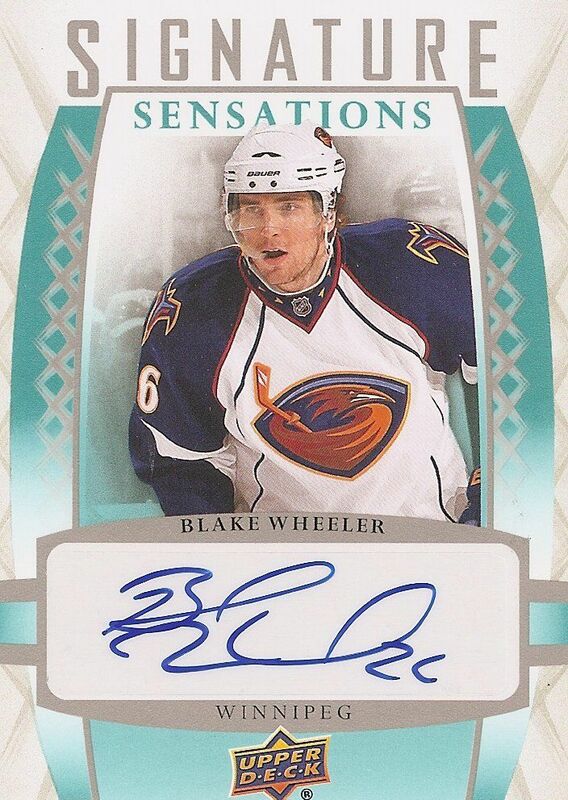 I have only opened 2 packs but the one card that I have seen that has stood out to me is #66. 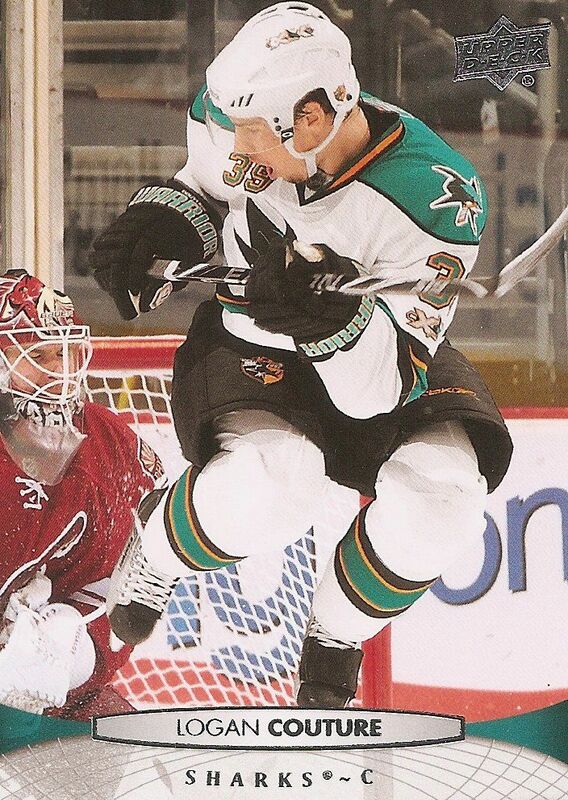 Its a great looking picture of Jason Spezza! It is of him in the dressing room holding up the puck that he used to score his 500th career goal. Its a huge milestone and its really cool that UD captured that with his base card. The new 11/12 UD Series cards are pretty nice looking, the inserts, base,jerseys, autos, the only thing is the young guns could of looked better, to be honest I really liked the young guns look of 09/10 series but the ones of 11/12 are still nice! Great review Luke! 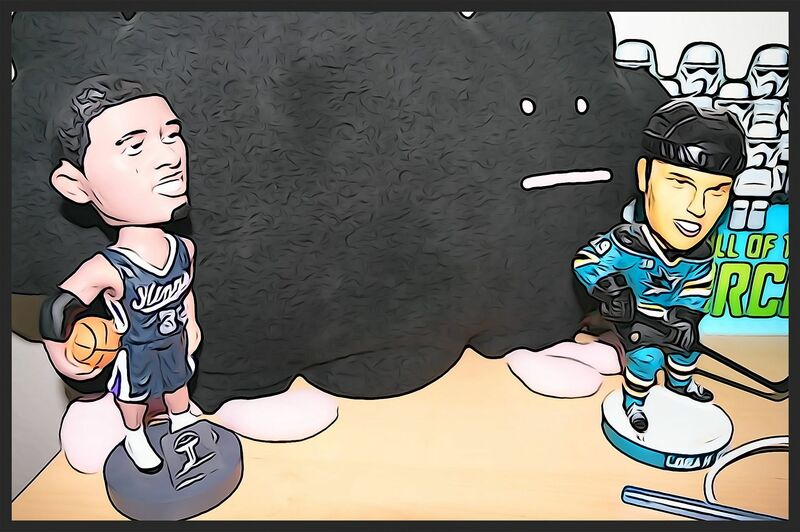 Yeah, my favourite card photography wise is #4 Evander Kane. It's just such a crisp shot, and I love the pose. He's also turning up the heat in the points department. Go Jets GO! This is an awesome product!!! My favorite card in 21 which is the James Reimer. It is awesome picture! I am interested in the young guns checklist. 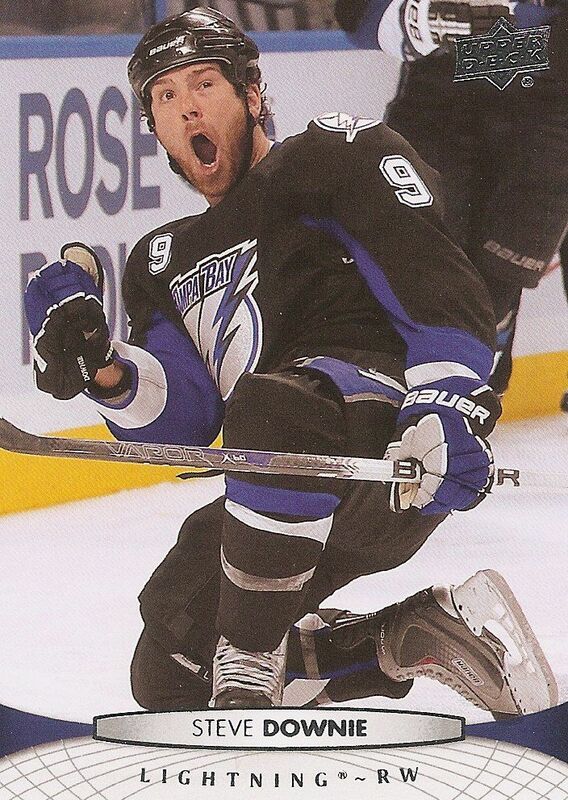 My favourite base card in 11/12 Series 1 is card #26 Steven Stamkos. I love how he's jumping off the bench to get into the action. Thanks for the contest luke! 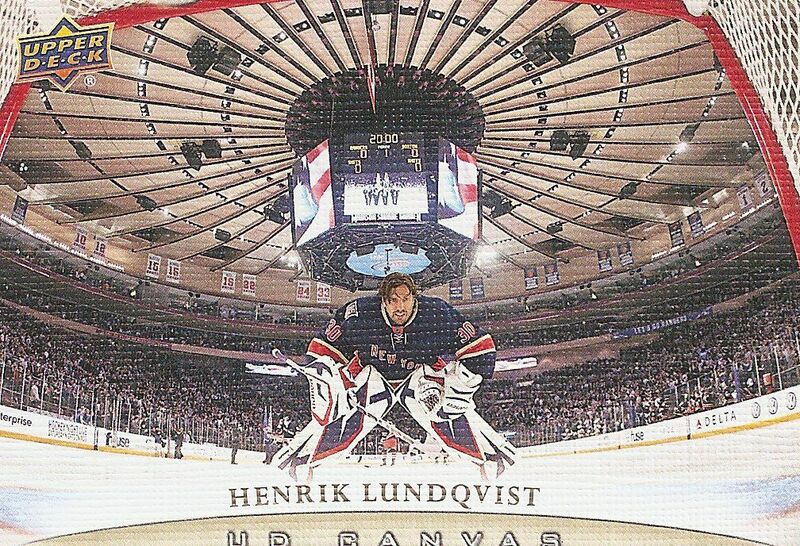 But i reaaly liked the Lundqvist canvas card, hope to see some more of those. but the all world teams are ugly. I havent had time to get my hands on this product, but as usual it is pretty decent! Last years really was good and it started to get people convinced that this product will become a must have every year. You can get a lot of Young Guns and a few jerseys for a decent price. I can rate this 9/10. 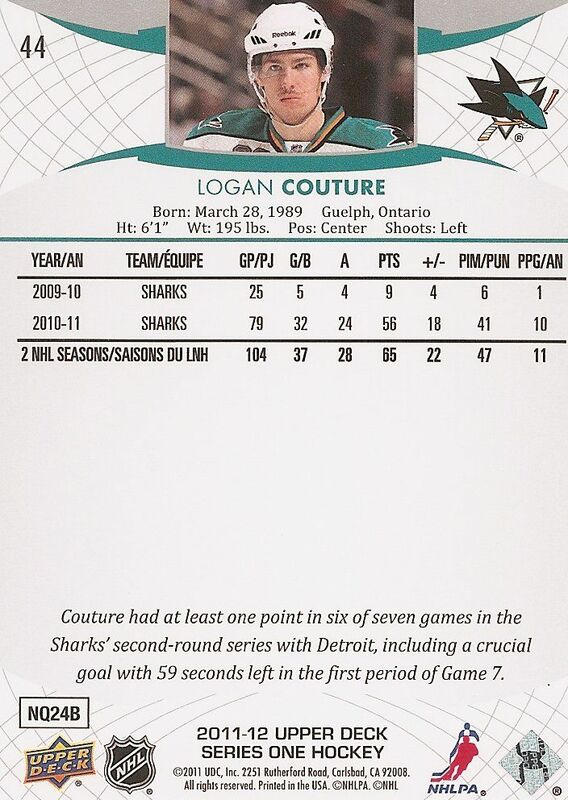 My favorite base card from series one would be Logan's #44, as i am a big Couture collector and fan. I also am a huge Sharks fan. The Picture on Couture's is pretty cool as well because he's jumping up to attempt to redirect a shot or screen the goalie, it makes it feel like your inside the action watching him attempt to score. 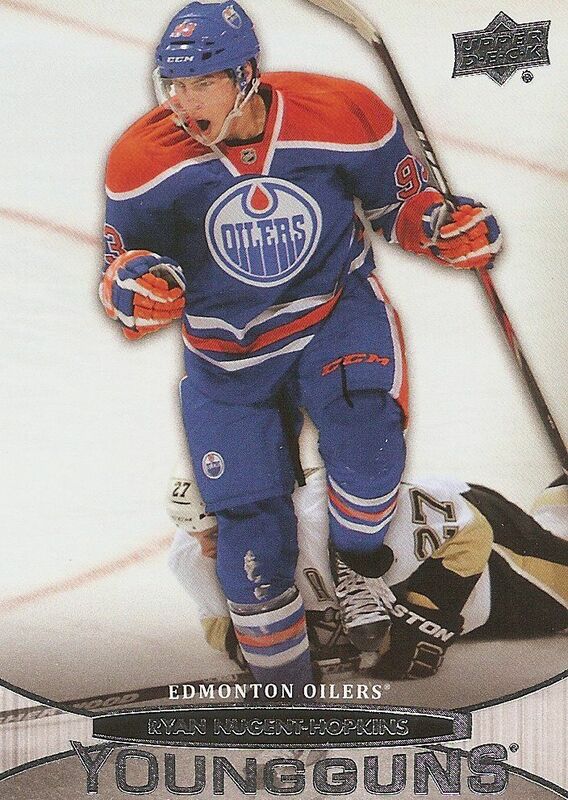 Lots to choose from, but my favourite out of the base set is the Dmitry Kulikov one. Open a few hobby packs today and thought that it was a really nice action shot of him flying in the air. I love the UD series 1 and 2 products. They are one of my favourite products every year. Since I am not a big budget collecter I usually don't buy boxes. But whenever UD series 1 comes out, I make sure to grab a box. I like the card design, its nice and simple. But the young guns could use some "livening up"
I haven't yet broken any UD Series one 11-12 yet but I know I soon will from reading your blog! 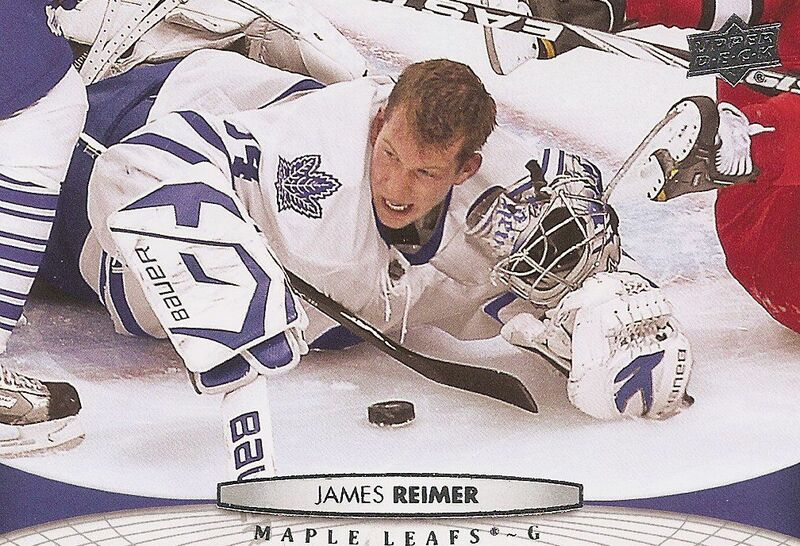 My favourite base card that I saw from your break was the James Reimer one. It's a really cool picture of him with an aggressive look on his face with his mask off. Personally I think this years design of the Young Guns don't seem that great. I think it's one of UD's worse design for the young guns. It looks very plain to me. I can't argue though that UD Series 1 always hold nice value for the YG RC's though. Last year I bought a single retail pack and pulled a crazy Taylor Hall YG and traded it to you :) Maybe this year I can pull a RNH or a nice Landeskog! upper deck did a really nice job on those cards this year.I think that the jersey cards look way better then the other years.My favorite card is card 8 of alex ovechkin because you do not see a lot of pictures like those. as a leafs fan I love the Reimer base card looks amazing of him making a save without a helmet! haha kinda like the old days, thanks for the contest Luke! CONTEST IS CLOSED... but feel free to leave more comments on your favorite photos from UD1 or tell me what you think of the product!